Lyme Disease is a bacterial infection caused by a tick bite. Symptoms begin about a week after the bite occurs. Lyme Disease gets its name from the place where it was first discovered - Old Lyme, Connecticut. A doctor diagnosed it in teens formerly misdiagnosed with juvenile rheumatoid arthritis. Each year, Lyme Disease affects about 300,000 people in the United States, and another 65,000 in Europe. 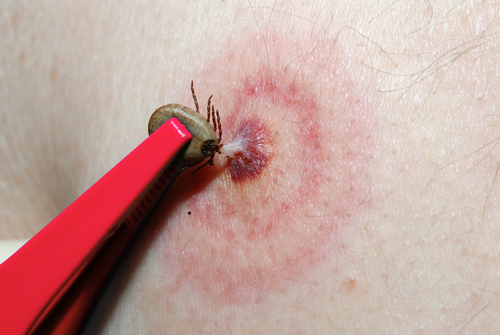 Symptoms of Lyme Disease begin with an increasing area of redness emanating outward from the tick bite wound. The red area is neither itchy nor painful. Roughly 1 out of 4 Lyme Disease sufferers do not develop this symptom. That's why many people ignore it and hope it heals on its own. Initial symptoms of Lyme Disease most often occur between May and September. Probably the best method for preventing Lyme Disease is avoiding ticks. Live in urban areas, for instance. If you live in an area where ticks cannot be avoided, wear long pants when walking in the woods or near trees. It may also help to wear a hat. When you get home, take a bath or shower, and check yourself thoroughly for ticks, especially in your hair. If you find a tick attached to your skin, remove it with a pair of tweezers, making sure to remove the head of the tick as well. The tick's head is embedded slightly under the skin. Then wash the area with soap and warm water. If an infection occurs, it's a very good idea to SEE A DOCTOR who can tell you How To Treat Lyme Disease more specifically. Effective antibiotics against Lyme Disease include Doxycycline, Amoxicillin, and Cefuroxime. Home remedies for skin lesions include topical treatments, such as a paste made of turmeric and lemon juice applied to the red areas.